To brew the chaga: Add 2 litres of water and ¼ cup of dried chaga chunks to a large pot. Simmer over medium-low heat for 30 minutes to 2 hours. When time is up, strain out the chaga chunks and store the liquid in large jars. Save the chaga chunks (they can be frozen for later use) as they can be re-used for brewing up to 4 times! 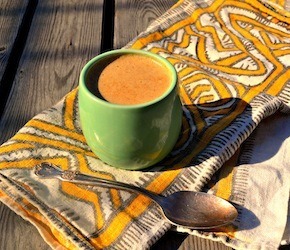 Heat up one and a half cups of brewed chaga from your batch, and pour it into a high-speed blender. Add desired quantity of butter, coconut oil, or ghee, one date (make sure that pit is removed! ), and sea salt, and blend until smooth and creamy. Enjoy as is or add in some vanilla extract, a tablespoon of raw cacao nibs, non-GMO soy or sunflower lecithin, and/or a tablespoon of grass-fed beef gelatin powder for some easily digested protein. All ingredients can be found at The Big Carrot Wholistic Dispensary.